We have reached the conclusion of “The 50s Cap Saga,” the storyline which began in issue #153. To summarize (most from the last issue): the Captain America and Bucky from the 1950s, who were cryogenically frozen after they became unhinged and went from fighting Communists to attacking anyone they regarded as not “real Americans,” were defrosted and went after the real Cap, whom they regarded as an impostor. Our hero recognizes in his doppelgänger a man who began with the best intentions, idolized the Cap from World War II, but was driven mad by an incomplete replication of the Project Rebirth process, ultimately sympathizing with him while steadfastly opposed to his twisted ideals. As this issue begins, the 50s Cap and Bucky are flying to Miami with Cap, Sharon Carter, and the Falcon as their prisoners—or so they think. Once they’ve landed—sound thinking, real Cap—our heroes attack the impostors, forcing the 50s Cap to use his… atom-blaster (wherever that came from). Not only do the 50s Cap’s weak costume and shield set him apart (as well as the boast about being “America’s savior”), but the torn shirt also makes the two Caps easier to tell apart (when the real Cap’s sunburnt face isn’t emphasized well enough by the unnamed colorist). That’s an odd comment about honor and madness at the top of the first panel below: It’s often said there’s no honor among thieves (which I would dispute), but accuse persons with limited control over their actions of failing to show honor is even more problematic. After the 50s Cap (with his face colored incorrectly) damages the Coast Guard ship with his… atom-blaster… he challenges the real Cap to a battle. Our Cap doesn’t want to wait, driven by anger, but luckily Sam is there to remind him of the danger at hand to the sailors (even if Cap needs a moment before he acknowledges it). Cap wants to meet the impostors by himself, but Sam and Sharon draw the line, demanding to accompany him, and he concedes. When our heroes do meet up with the impostors, Sam and Sharon take care of Bucky, who denigrates both of them, but gets his comeuppance. The stop-motion effect of the panels below is marvelous (and rather innovative at the time, at least for mainstream superhero comics). Meanwhile, Cap prepares to confront his 50s doppelgänger, and his conflicted feelings are apparent in the bottom two rows of panels. Cap is being far too hard on himself—which we would expect, given his humility and exaggerated sense of responsibility—but we can safely push back against some of his self-incrimination. 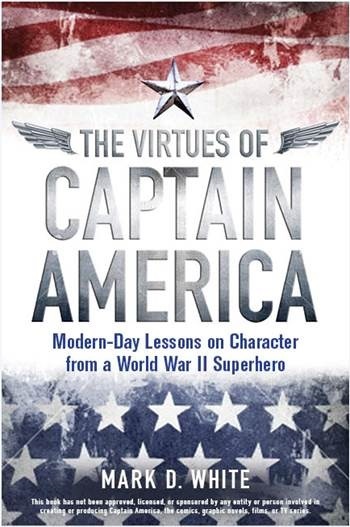 He is correct that the 50s Cap is, in a way, a dark reflection of himself, but I’d hardly call him the “evil side of [his] nature.” Steve Rogers became Captain America because the Project Rebirth treatment accentuated the virtues he already possessed; the 50s Cap apparently started with the same virtues, but due to the fact that he only received the super-soldier serum and not the Vita-Rays that went with them, his mind was damaged, and hatred and bigotry overcame him. We can’t be sure where these feelings originated—if they were part of the 50s Cap all along or a direct result of his mental illness—but there’s certainly no reason for our Cap to think they’re any part of him (at least not based on this evidence). More important, Cap does not bear responsibility for anything the 50s Cap did, even if he did serve as an inspiration to him. Before he became mentally ill, the 50s Cap acted of his own free will—and apparently honorably—and afterwards, his actions were influenced by the paranoid schizophrenia (according to the “diagnosis” given in the last issue), and were therefore technically no one’s responsibility. Cap may have inspired the man who became his successor, but he is hardly responsible for anything that man did, good or bad. Apparently, the 50s Cap did watch some swashbuckling movies, though. As they fight, our Cap gives the 50s version some lessons in the realities of modern America (or, more accurately, the neglected realities of America in any era), connecting the hate-filled, bigoted 50s Cap with fascism (as he and Sam did in the last issue). The battle continues until the real Cap corrects his doppelgänger’s misapprehensions regarding who he is, apparently creating such conflict inside the 50s Cap’s already compromised psyche that he snaps. The exposition in the final panel above is fantastic in its parallelism, as well as the emphasis on Cap’s existential loneliness. The 50s Cap and Bucky will both be back, in very different roles, in future issues—and this is hardly the last time Cap will confront alternate versions of himself, forcing him to confront issues of his own identity, origin, and purpose (as if he doesn’t think about these things enough as it is!). And don’t forgot, we have yet to meet the Captain America of the late 1940s (mentioned in the last post)—or rather, both of them.